Lock in a great price for K7 Bed and Breakfast – rated 8.8 by recent guests! Quiet and secluded but not too far away from everything. Wonderful owner. She was very accomodating to our requests for eating utensils and bowls to use in our room. Also prepared our pancakes from Paleo mix we provided. Room was clean and well kept. Staff was very friendly. We loved the location as it is less than 5 minutes from our relatives. The breakfast is reasonable and delicious. We will be back soon! Great breakfast! Specially the coffee and comfy beds! I booked 1 night here, as a middle stop between Vegas and Death Valley. The owner is really nice and helpful. The room is small but cozy. The breakfast is included, simple but with all the basic stuff you need. We had to leave our room too early to eat breakfast there, but during future trips will try both the breakfast and other menu items. It all sounded wonderful. The location was also really good for us. The location of the K-7 /B&B put us much closer to where we had to be which saved drive time. Location is good - one hour away from Vegas, 1,5 to Death Valley NP. Self check-in was very easy, the owner contacted us and provided the code since we were arriving after hours. Clean. The room was clean. Easy check-in & check-out even for late arrival. Good price. We arrived earlier than expected. Raja let us know that our room would be ready by 300. We drove around town to get a lay of the land. We returned at 3, our room was ready and exactly like the photos we saw online. The meals were amazing! Try the Kale salad (they grow their own produce), even if you aren't a fan, it's delicous! There are several tasty dishes on the menu to choose from. I'm a vegetarian, I had the butter vegetables. My husband had the butter chicken. We weren't disappointed! Little Ceaser and Domino's $5.00 meals have nothing on their pizza! K7 B&B's pizza and beer there are worth every penny and every bite! Patty and Raja are wonderful hosts! It was our pleasure and luck that they took the time to sit and share the Parhump stories and history with us. They didn't kick us out at closing, they let us stay a little longer to chat. We will definitely stay there again! 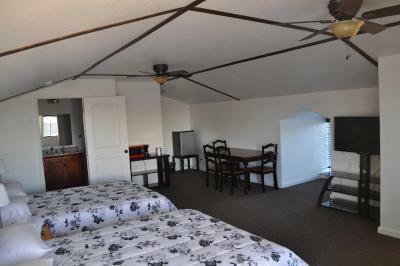 Offering a restaurant and bar, K7 Bed and Breakfast is located in Pahrump. 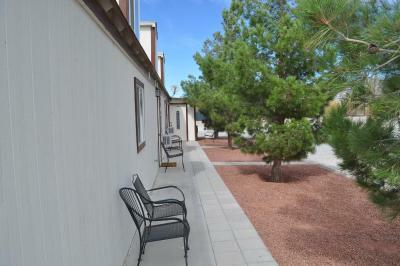 Free WiFi and a private bathroom are available in each guest room. The bed and breakfast offers a country and rural atmosphere. 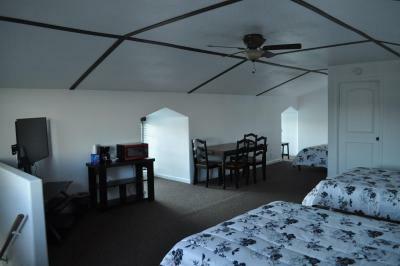 A flat-screen antenna TV is provided in each air-conditioned room at this B&B. Complete with a refrigerator, the dining area also has a coffee machine and a dining table. Featuring a shower, private bathrooms also come with towels. Guests of K7 can purchase a daily hot breakfast between 07:00 and 09:00. Breakfast choices include a breakfast sandwich, pancakes, sausage, or French toast with fruit. A limited menu featuring pasta, curry and quesadillas is also available. If they prefer, guests can purchase boxed lunches. The Pahrump Nugget and Mountain View Casino are within 6.8 mi away. Spring Mountain Race Track is 3 mi away. The property offers free parking. When would you like to stay at K7 Bed and Breakfast? This air-conditioned room has a flat-screen TV, a dining area and a microwave. This family room has a microwave and air conditioning. Please note: This room is located on the second floor of the property and only accessible by stairs. There is no elevator available. House Rules K7 Bed and Breakfast takes special requests – add in the next step! K7 Bed and Breakfast accepts these cards and reserves the right to temporarily hold an amount prior to arrival. Please note: There are no additional beds available to be added to any room types. Parties and excessive noise are not permitted at this property. Please be respectful of all guests during the times of 22:00-08:00. Guests can purchase box lunches for USD 12.00. Please note: If you are arriving after 21:00, please advise the property as they do not have 24-hour check-in service. - Damages to the room or missing items may result in additional fees. The room was big enough for a family of 5. The owner was very nice and available. Bathroom was small but didn’t really matter. Beds were a bit harder than some of us like. Room was crowded with two double/queen beds; not much room to walk between. There was a small eating table with chairs that also left less space. If there was only one bed, the space would have been better. The bathroom was huge & had nice large walk-in shower. Room was very clean & staff was great. It was a little chilly in the morning and the room didn't have any heat so if traveling in the cooler months this could present a problem. Location was good, just on the outside of town. Very quiet and comfortable. Breakfast was basic. Communication prior to visit was accommodating. Everything was what I expected or even more!! All eco-friendly, clean and quiet. I wish I was in town longer. Beds were not the most comfortable. It is just a mattress on a frame without a box spring. For the setup, it provided good support but isn't ideal for a stay involving several nights. It is not along the main highway. It is about 3 miles off NEV 160 in an open area or sparsely populated area. To some this may feel uncomfortable place to stay, if you like things around or near you. Friendly staff and quiet. Not crowded area. Too far from Death Valley. The bed was terrible comfort wise. The location was close to what we went there for.